L I V E. L A U G H. L O V E. S W E A T.
6 WORLD TITLES. OVER 30 PROFESSIONAL WINS. SEE THE SPORT IN ACTION ON THE MEDIA PAGE! The sport of log rolling was a direct result of river driving. The art of standing on a log and rolling it was one that was perfected by the men as they drove the logs down the rivers. When they reached the sawmill, and all the river drives were finished, the lumberjacks and logging camps would have contests to see who was the best axeman, sawyer, or river driver. For the contest of river driving, they would put in upwards of two or three men on a log in a river or pond, and let them roll it out. The last person still standing on the log was the winner. And so the sport of log rolling was born. Now the athletes representing these sports from over 150 years ago are men, women, and children who know how to train hard and have a great time! Back in the 1970s log rolling was introduced to the West YMCA in Madison. In 2005, Olivia Judd and Shana Martin began teaching outdoor log rolling lessons at Wingra Canoe and Sailing Center. In 2007 the first boom run was set up in Madison. 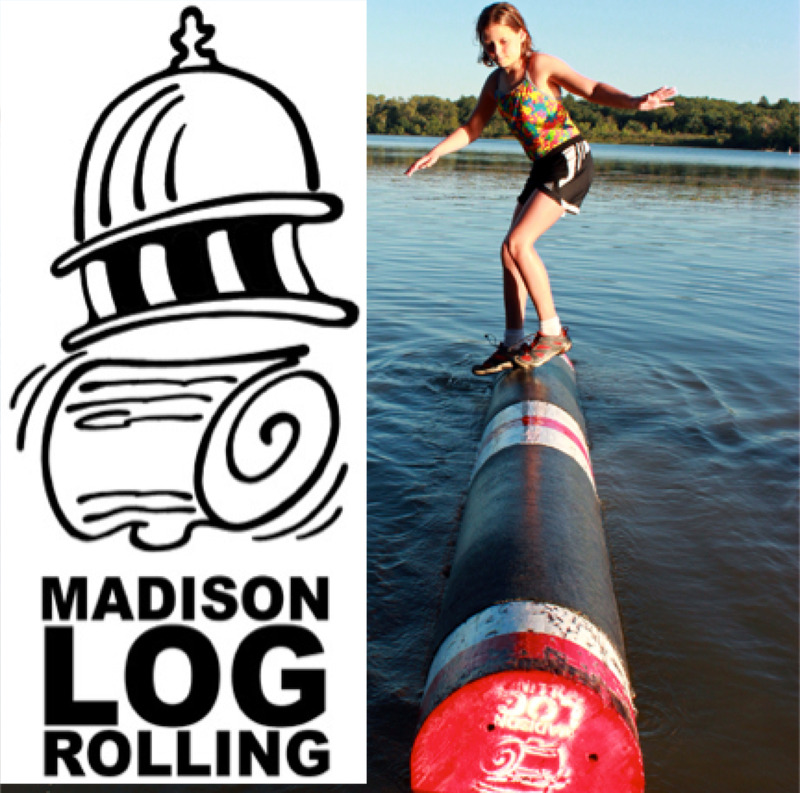 And in 2010, Madison Log Rolling LLP was formed to preserve the rich history of Wisconsin logging by growing the sport of log rolling in the greater Madison community. Since Madison Log Rolling was founded, the program has grown from two logs and a dozen students, to training hundreds of students each year. Our Wingra program now has 13 coaches on staff and over ten logs. The Madison Log Rolling logs and boom run also serve as a training location for elite competitors across the Midwest. We work hard in our classes, but also emphasize having fun and building community. Team members frequently form friendships that extend outside of class, and it's not uncommon for log rollers to show up in elaborate costumes for our annual end-of-season party. We welcome rollers of all ages and abilities to join in on the fun through classes, private lessons, and parties! Not only does the unique sport of log rolling preserve the rich history of lumberjack sports in North America, this sport is simply the most fun any age level can have in the water! The continuous reward system of staying on the log longer and longer with every practice leads to a wonderful feeling of self- satisfaction for any new student. The sport of log rolling promotes balance, leg and core strength, cardiovascular endurance and overall functional coordination. As shown below, starting a program is quite simple, and the USLRA has many resources to help grow your program and encourage your students to compete! Unsure if a log rolling program will be successful in your area? The USLRA Charitable fund enables a program to obtain a log free of charge (other than shipping). As the program is launched, the fund will be repaid over a set period of time. If the program does not succeed, the log can be returned with no penalty to the facility. Logs can be ordered through various sources. As of now the three popular sources creating high quality log rolling logs are Lumberjack Enterprises of Stillwater, Minnesota, JR Salzman of Hayward, Wisconsin, and Key Log Rolling of Minneapolis, Minnesota. Logs can be made to your specifications and shipped. Click HERE to download the FREE Log Rolling 101 E-Book with details about program safety, class structure, games, and competing. Visit the USLRA YouTube Page to view dozens of instructional videos to help with your programs and training.